Originating in the 1800’s, the Village of Streetsville in Mississauga is advertised as the historic downtown of the area. The idea of a ‘historic downtown’ is popular in many cities throughout the GTA and North America because it acts as a tourist attraction or a view into the past that exists in the present. It is original, interesting and different because it contrasts with modern day North American city development which is highly influenced by auto mobility. A historic downtown differs from a regular downtown in the sense that it is intended to include and emote the elements of history and preservation, whether they may be through architectural styles, materials, building footprints, streetscape style, or connectivity. Many downtowns are situated where they always have been simply because development would have always grown out and spread out from there. But when it comes to rapid-growth cities like Mississauga that are custom-made for automobiles and purposely designed with inward-facing bubble spaces, historic downtowns don’t get the appropriate preservation and respect they need to survive over time. Today, Streetsville seems caught in the middle of an auto web, and it is clear that most of the remaining historic downtown can only be found in its name. Building facades are altered using cheap or unfamiliar materials, infill development has no overall design mindfulness for surroundings, and spaces are not well maintained. The effort to preserve the historical buildings is not evident enough to help them stand out in most cases. From a first impression, Streetsville does not appear to be interesting and different – rather, it just looks kind of… boring. 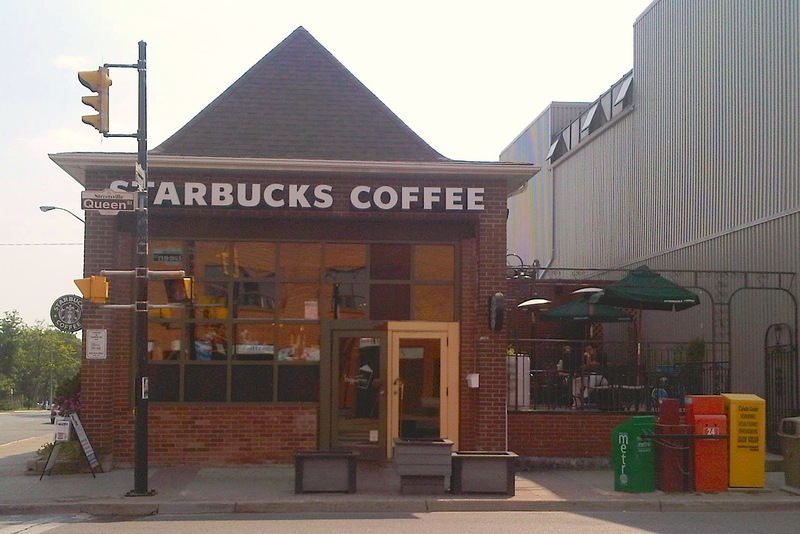 Even though Streetsville appears to have had a poor preservation treatment it still has its inner city gems, one of which is the Starbucks. It is located on the corner of Queen and Thomas in an older building. It clearly has an adaptive-reuse look, which is in line with general historic downtown principles. The front facade is no wider than 5m long (typical of a true downtown storefront width) and is glazed with a large window and divided into squares with wooden beams. The interior of the cafe reflects its past state – narrow and long, and it leads to a small and enclosed outdoor patio with umbrellas that interacts nicely with the sidewalk. As much as accepting a Starbucks into a historic downtown is not a good idea because local businesses should be promoted over international chains, this particular Starbucks fits in better with the intended historic image than most of the other family run businesses in the area. Click here to view more heritage buildings in the area. Streetsville could be saved if more consideration is put into its character before it is completely lost. As it is now, a faint wisp of a time when things were different can be sensed. It is only a matter of time before Streetsville gets swallowed up by its successor along with all of its roads and cars. This this vision sounds like the key to Streetsville’s future success, however, exactly 5 years later there are no clear signs of moving forward. Pat Donaldson, the General Manager of the Streetsville BIA says that it is a matter of money. The 5 year improvement plan could have been realized if adequate funding was available, however there are not enough funds to realize their goals. The process is therefore slowed down. 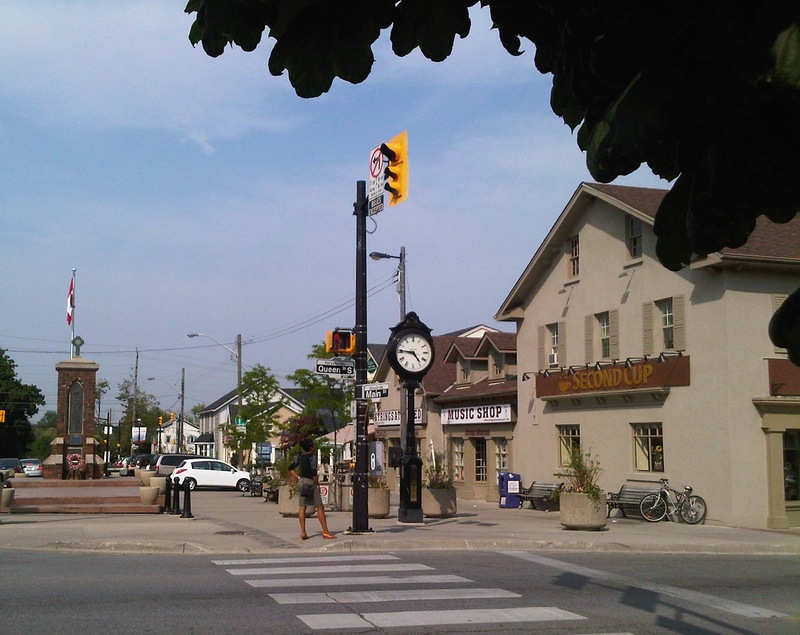 Streetsville acts as a meeting point for many celebrations involving the community such as Canada Day, the historically significant Bread & Honey Festival, and the Santa Claus Parade. There are also many community events that are held throughout the year. Because of these special occasions many residents in the Mississauga area know about Streetsville and have some amount of place attachement towards it. This means that the location has a base and a reputation to work and build on. 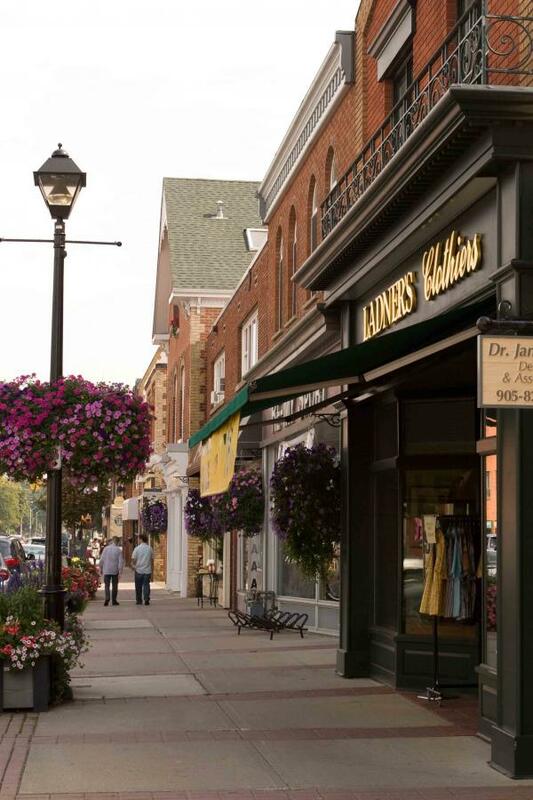 Streetsville needs to give visitors more reasons to visit, shop and relax regularly – not just a few times a year when the entire community gets together to celebrate special events. Many people come in to Uptown to go to work. This gives the area more exposure and gives other types of businesses the chance to open up shop to cater for the workers. The force of agglomeration has caused the spot to flourish. This category is arguable, because it is still lacking. However, there is a good handful and a variety of great shops to visit such as Death Valley’s Little Brother, The Princess Cafe, The Princess Cinema, Barley Works, MyThai, Starlight, Skirt, Shoppers Drug Mart, Value-Mart, Starbucks, Eating Well, American Apparel, the LCBO, Thrive Juice Bar, and Vincenzo’s. Some of these are substantial or international chains, however they draw a variety of demographics to the area and give other shops the chance to be exposed. A german bakery opened up shop across from the Starbucks a few months ago and it is already a popular destination for office workers to buy breakfast and lunch even though world-renowned Subway is directly abutting. It is very important to create an outdoor space that fosters an environment for pedestrians and cyclists in order for the shops to be successful. There is a very small chance that a person in a car is going to stop in the middle of a busy place because they saw a dress in a window that they liked. The only way businesses can be successful is if the pedestrians feel comfortable enough to be pedestrians in the first place – this means creating a sense of enclosure, safer street crossing, a lot of seating and overhead shelter, and an interesting streetscape, which is achieved by breaking up facades and making sure that they are not too long and by creating some form of repetition with planters or attractive light posts. It is also important to break up these progressive spaces with passive spaces such as squares. The Waterloo Town Square is a very inviting node and it is used by all demographics for a variety of reasons and activities all year round. Uptown Waterloo is connected with the rest of the city on a multitude of levels and is working towards advocating the theory of complete streets. 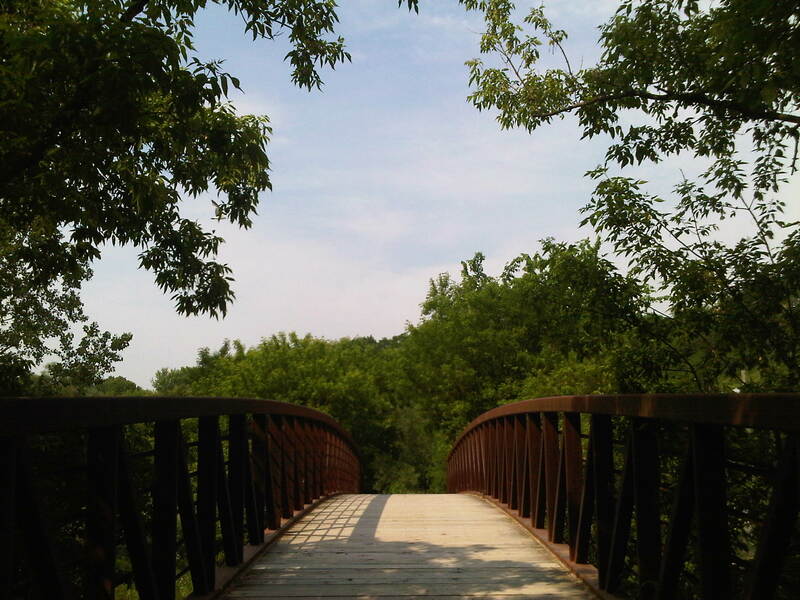 In Streetsville, it is unclear as to how to find the park, river or arena, and it seems to be more convenient to drive from the heart towards that space. In Uptown Waterloo they have created a multimodal system called the Uptown Loop which advertises little informative signs throughout Uptown that helps new and returning visitors get around by foot with confidence, and also helps them become aware of what they can do and where they can go. The nodal Waterloo Town Square is also home of several bus stops including the iXpress which connects riders to the north or to Downtown Kitchener in about 10 minutes. Again, Uptown Waterloo is not there yet, but regardless it does have a strong sense of place and a distinct character. A sense of place plays a critical role in creating a space that people will want to use night and day, summer or winter. A place needs to have a very recognizable and memorable feeling, look, and use. A clear sense of place is vital for the success of a place. As a first step, the BIA council has done a great job at coming up with some very strong goals that are sure to improve Streetsville. However if their methodology is influenced by what the planners have done in Uptown Waterloo and by other successful historical downtowns in North America (such as the Distillery District in Toronto, the Historic Downtown Bowmanville in Bowmanville, and Pioneer Square in Seattle), then maybe they can achieve their goals successfully.